Today the all-seeing eye is more likely to be seen as an “Illuminati” symbol of control and surveillance by elites who to a large degree run the show on this planet at this time. This is because, over time, dark sinister forces have taken over esoteric symbols that for thousands of years were used to convey positive, helpful, uplifting spiritual messages and principles. The all-seeing eye is a prime example of how spiritual symbols have been hijacked and inverted. There has not really been much push to understand the symbol’s original meaning or to reclaim it for the spiritual significance it first conveyed. This is the first in a series of articles I am presenting that will take a closer look at individual symbols, and delve into their origins and history to uncover their deeper esoteric significance. I am writing these as part of an effort to reclaim these positive esoteric symbols and restore them to their previously esteemed state. Symbolism has long been used by humanity to communicate ideas which are best crystallised in a compact form. As the well-known saying goes, a picture tells a thousands words! Esoteric symbols are alive today as they were in the ancient past, but there is much confusion surrounding their usage, history, intent, and meaning. In ordinary life we use symbols to show at a glance important information such as traffic and road signs amongst many other symbols which are widespread and common today. Some other examples are corporate logos and certification statuses. Symbolism is also especially used in the communication of non-physical, spiritual ideas, phenomena, and processes. The all-seeing eye is one of the most powerful and widely used – and misused – symbols of all. In this article I trace its use from the earliest of times through to the 18th century, and show what the symbol originally stood for. My next article will examine its use from 18th century freemasonry onwards, and show how it has since been hijacked and misused. We perhaps find the precursor to what eventually became known as the all-seeing eye in the Rig Veda, a sanskrit text thought to have been written over 3,000 years ago and one of the oldest known texts. In it, there are many references to the sun and to other deities as being an eye in heaven, as an eye which reveals creation, or an eye which never closes. One can liken this to being symbolic of a high level of awakened consciousness that advanced spiritual beings have and which an ordinary person can potentially attain. The Hindu god Shiva has three eyes. The third eye or brow chakra eye is known as the eye of Shiva, possessor of all knowledge, which when opened will destroy anything it sees. Thus it is a symbol of knowledge which destroys evil and ignorance. This again can be likened to an awakened higher spiritual part of a person which sees the truth of things and can then eliminate within a person’s psyche that which is opposite to and blocks divine consciousness from manifesting more. In this way it is a “creative destruction” of evil to transform it into higher consciousness. Even in modern times, the eye of Shiva is used in jewellery to give protection against evil to its wearer and to gain wisdom and understanding from the world, from life events and from the self, for positive transformation. In Buddhism, Buddha is referred to as the Eye of the World. It is typical for temples in Nepal to display a graphic of the “Eyes of Buddha” as shown to the right – notice it includes a mark for the “third eye” as well. The eyes are also known as the eyes of wisdom and compassion. Statues of Buddha typically show a dot in the mid-brow to represent the third eye. It is interesting to find that the Egyptian hieroglyph for their god Osiris contains an eye as shown below. So as with Hinduism and Buddhism we find a spiritual deity being represented in ancient times as an eye. In ancient Egypt, the all-seeing eye was known as the Eye of Horus or the Eye of Ra and also formed part of the symbology of Wad-jet. Through various myths they were symbols of protection, healing and restoration. The left eye of Horus was said to be the moon and his right eye the sun. Horus was a falcon-headed sun god and it could be said the Eye of Horus was styled like an eye of a lanner falcon with its marking beneath the eye. It is also very interesting to note that the drawing of the Eye of Horus very much matches the cross section of the mid brain where the thalamus, the pineal and pituitary glands are situated. The pineal gland is often said to be the “third eye” and a centre of spirituality and of spiritual insight, which can be developed in a person. It’s as if the Eye of Horus could be a depiction of the thalamus as the eye ball with the corpus callosum the eye brow above and the medulla oblongata (brain stem) and the hypothalamus being the two markings below. If this is what they were drawing but calling it the Eye of Horus, does it suggest they considered the mid brain to be the seat of consciousness or even of divine consciousness or “Horus consciousness”? Horus being a sun god and symbolic of the universal Christ, a spiritual force which a suitably prepared person can merge with. In the Middle East the all-seeing eye has been known in the form of a hand-eye symbol called either Hamsa, Khamsa or Hamesh. It’s the symbol of an eye in the palm of a hand, usually the right hand. Again it is a symbol of protection against the evil eye (bad luck caused by jealousy from others) and danger in general and can been seen as a good luck charm in that way. where the eye would be. The Hamsa has been used for thousands of years and is still in use today as amulets, charms or wall hangings. It would seem to have its origins from ancient Mesopotamia with the hand of Ishtar being a symbol of divine protection although it did not contain the eye in the palm. A more Christian-themed representation of the Hamsa is an art work called “The Divine World” by Kahlil Gibran, a Lebanese Maronite Catholic prominent in the early 20th century as a poet, painter, writer, philosopher, theologian. In Greece and Turkey they have something similar to the Hamsa which they call a “Nazar”. It is just an eye without the hand but it is used in the same way and has the same meaning as the Hamsa, that is, to ward off the evil eye, in the form of amulets or hanging ornaments usually made from blue glass. Similarly in Buddhism there is the “eye of Buddha” amulet to ward off the evil eye. The symbol of an eye in a hand also appears in Aztec and Mayan cultures and in Native American artworks although archaeologists are not sure what meaning it had for these cultures. farmer in Moundville, Alabama in the 1800’s. Some archaeologists think its symbolism may have represented a portal to spiritual dimensions. It is the most elaborately decorated artwork found at Moundville giving rise to the belief it was of the most importance to its creators. Other artworks found there also contain the hand-eye symbol. There is also the amazing discovery in 1984 in La Mana, central Ecuador, of an ancient artefact referred to as the Black Pyramid amongst 300 artefacts found there of unknown origin. It is not known what culture they come from and the many objects found are baffling and seemingly out of place for this part of the world, such as an object designed as a hooded King Cobra of south east Asia. Cobras don’t exist in South America. The so-called Black Pyramid is made from black stone with an eye at the apex. The stone has gold inlays forming 13 levels of “bricks” and an eye at the top. These inlays glow when under black light. Overall it looks like a representation of the great pyramid of Giza (7,470 miles away) and also amazingly just like the eye pyramid symbol used on the Great Seal of America and the US $1 bill. It is also interesting to note the cobra artefact has another similarity with ancient Egypt where the raised cobra is associated with the Eye of Horus/Ra and Wad-jet in their protective aspects with it being worn on the foreheads of Pharaohs at the mid-brow right where the third eye is located. This symbolises the raising of a person’s energies to a higher vibration which internally leads to the awakening of psychic faculties such as those latent in the third eye. It is not known how old these objects are as dating them has not been possible but they are thought to pre-date the known ancient cultures of the region. There is also a pre-Sanskrit type language (making it very old) engraved on some of the objects including on the underside of the black pyramid where there are also markings which appear to map out the stars of the Orion constellation, which the pyramids at Giza also map. The 4 pre-Sanskrit markings are thought to translate as saying “the son of the creator comes”. Given the care taken to create this object it would seem to have been an important symbol for its creators although it is not clear how they interpreted it. So here we see in an ancient text of the western world similar representation of the sun like that presented in the ancient text of the east, the Rig Veda, as being an eye of the creator and an all-seeing never closing eye watching over and protecting the good. Does the Talpiot tomb display an all seeing eye? A possible first known use of the all-seeing eye symbol in Judeo-Christianity is the so-called “Jesus tomb” from 1st century AD discovered in 1980, which uses a similar symbol over the entrance to the tomb. Regardless of whose tomb it is, could this be a first known or early use of the eye-pyramid symbol in the Judeo-Christian tradition? In Christianity, the all-seeing eye or “Eye of Providence” or “Eye of God” has been used as a symbol from at least the 16th century as seen in the following painting below which depicts a scene from Luke 24: 13-32 where after his resurrection, Jesus has supper with two disciples. 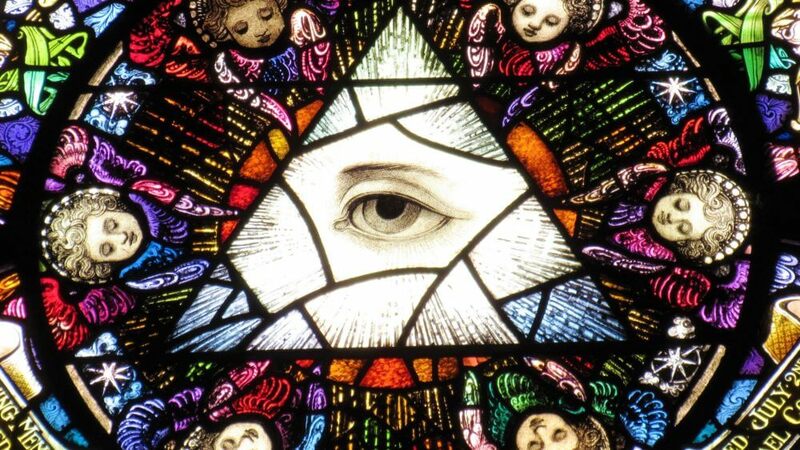 The eye is inside a triangle, and surrounded by rays of light, with the triangle representing the holy trinity and the whole symbol meaning God’s omnipresence and all-seeing eye watching over creation. Some claim that the eye in triangle symbol was added to the painting soon after the Council of Trent 1545- 1563, to conform with its canons and decrees but even if that is so that would still place its use in the 16th century. In Alsace, France, the fresco painted above the altar of the Abbey Church of Saint-Jean-Baptiste (1763) shows a large example of the eye-in-pyramid symbol, with the rays of glory breaking through the clouds. Another example is on the Aachen cathedral in Germany. It was originally built in the late 8th century under the Emperor Charlemagne and then enlarged in the middle ages with various other changes and updates along the way. It would seem the all-seeing eye symbol was placed on the cathedral in 1766 to mark the renovations done that year. Note that these first two examples pre-date the founding of the Bavarian Illuminati (1776) although Freemasonry already existed in England and Europe by this time. Perhaps it was a masonic influence that saw these symbols used on these cathedrals yet it was not until about 1797 that masons are regarded as beginning to use the eye-in-pyramid symbol.